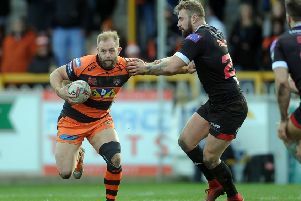 Castleford Tigers boss Daryl Powell has challenged his players to get the defensive side of their game back together at Hull this Sunday after saying it was not good enough over Easter. After averaging around the 14-point mark for points conceded in the first eight games the Tigers conceded 24 in their win over Wakefield Trinity then 26 in defeat against St Helens and Powell was not happy with either total. He told the Express: “We do score some good tries and play some great tries, but we dropped off defensively over Easter, conceding 50 points, which is way below our standard. “While we know we’re going to score points that’s not good enough.